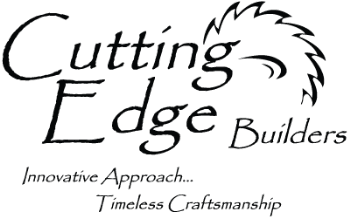 Creating a home of lasting value is top of mind for those building a new house. For most of us, our home is our largest investment, so of course we want to see our hard-earned dollars protected. Homeowners building a modern house want an innovative design, but not at the cost of it looking dated in a few years. Aesthetics and initial cost must be balanced with maintenance. When researching the materials and finishes for your new home, understand the level of maintenance that different materials require, and the time and expense entailed. Choose materials that don’t require more upkeep than you can undertake. Here are examples from new homes and iconic vintage homes that get the exterior finish right. Be climate- and region-specific. Find homes in your area with the exterior finishes you are considering, and see if you are comfortable with how they have stood the test of time. 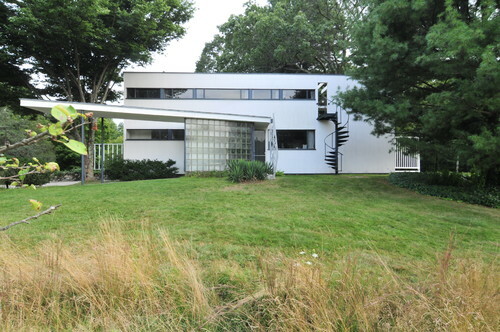 Renowned architect Walter Gropius did exactly this when he designed his own home in Lincoln, Massachusetts, in 1938 — one of the first modern houses in New England. Now almost 80 years old, the house is a great laboratory for how materials age. 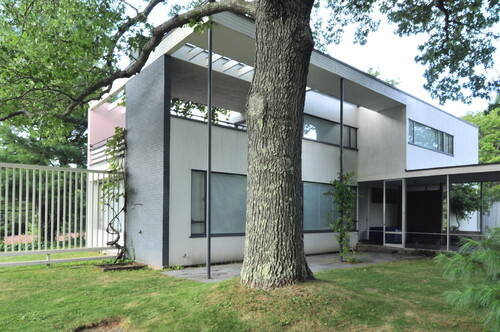 Although the house offers a startling contrast to its neighbors, Gropius took his cues from the materials on the surrounding Colonial homes, covering his house with wood siding painted white and adding a brick chimney. The building is set on a foundation of local fieldstone that extends into the landscape to form terraces and site retaining walls. The painted surfaces are readily freshened up, and the fieldstone can be left natural to develop a beautiful patina of moss and lichen over the years. The house is climatically smart as well. Whereas the north-facing front facade has limited areas of glass, the rear of the home opens with more glass to take advantage of winter sun. The second-floor sun porch makes good use of painted wood for the trellis and the wood privacy wall. The floor decking is left unfinished to age over time. 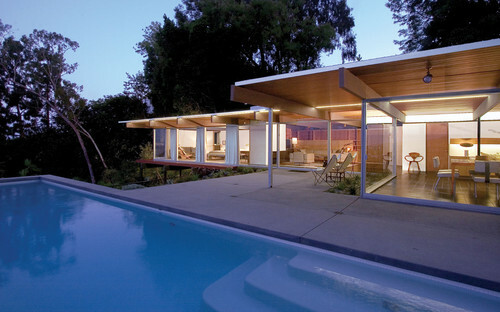 The Case Study House No. 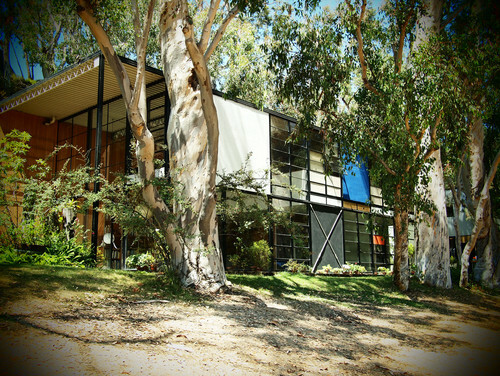 8, designed by Charles and Ray Eames in 1949, is carefully tuned to a much different climate. The structural frame of the house is painted steel, which wears well in the desertlike climate of Southern California. The striking blue and white solid panels, made of durable painted stucco and wood, also hold up well under the California sun. Alternating with the solid panels are large industrial windows with painted sashes. The large glass areas of the Eames house are designed for the temperate winters of Southern California, and they’re quite a contrast from the smaller windows and more solid appearance of Gropius’ house. Use clear-finished natural wood sparingly. Many of my clients start the design process with the idea of having a clear-finished natural wood exterior that will sparkle like a polished hardwood floor. Keeping an exterior like this looking fresh is challenging to even the most maintenance-savvy homeowner. Think of wood with a clear finish as precious millwork that needs to be maintained regularly. A smarter approach is to use such wood for focal points, like the front door and related trim. In this house by Suyama Peterson Deguchi, natural wood clads the front doors and immediate vicinity. The wood focal point draws the eye to the front door and creates a dramatic sense of entrance. 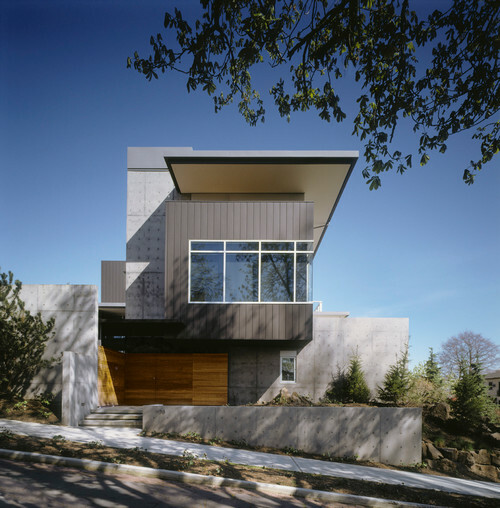 The wood is a warm contrast to the rugged concrete and metal panel materials that clad most of the exterior. Protect natural wood finishes from weather and direct sun. Another practical approach to naturally finished wood was taken by Richard Neutra, who emigrated from his native Austria in 1923. Whereas Gropius settled in New England, Neutra headed for Southern California and went on to become one of the leaders of West Coast midcentury modernism. Neutra understood that natural wood finishes can deteriorate quickly with exposure to the powerful SoCal sun. In his 1956 Troxell residence, beautifully renovated by Hughes Umbanhowar Architects, Neutra fitted the house with expansive overhangs for protection from the sun. The natural wood of the interior ceiling extends to the underside of the overhangs, creating a continuity from indoors to out. 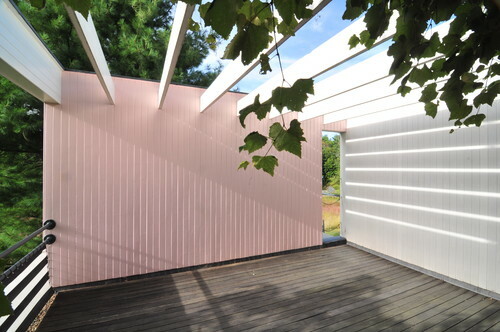 Located on the underside of a soffit, the wood maintains its fresh appearance because it’s never exposed to direct sun. Paint exposed wood. 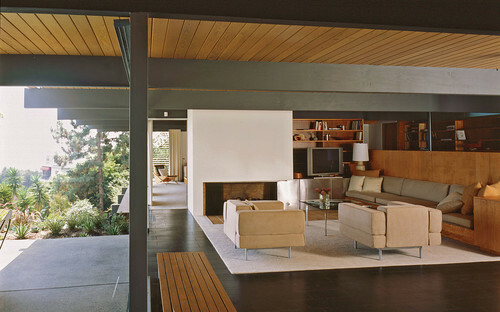 In the same home by Neutra, the structural beams also extend from inside to out. Instead of having a clear finish, they are painted a sharp gray. This not only contrasts nicely with the natural wood, but it also protects the beams where they are exposed to weathering beyond the overhang. Unfinished wood: A more carefree approach than trying to maintain a natural wood finish is to leave the wood completely unfinished, allowing it to turn a silver-gray with age. Start with a rot-resistant wood like redwood or cedar, and let it “go gray.” This approach is best in coastal zones, where the cedar turns a beautiful gray — think the classic gray shingled houses of Nantucket or the Hamptons. 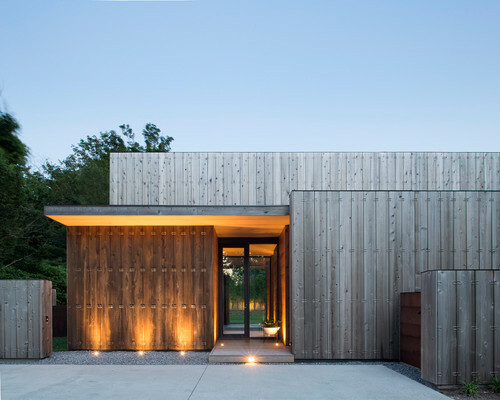 Bates Masi + Architects adapted this tried-and-true approach to the strikingly modern Elizabeth II house, clad with unfinished natural cedar. 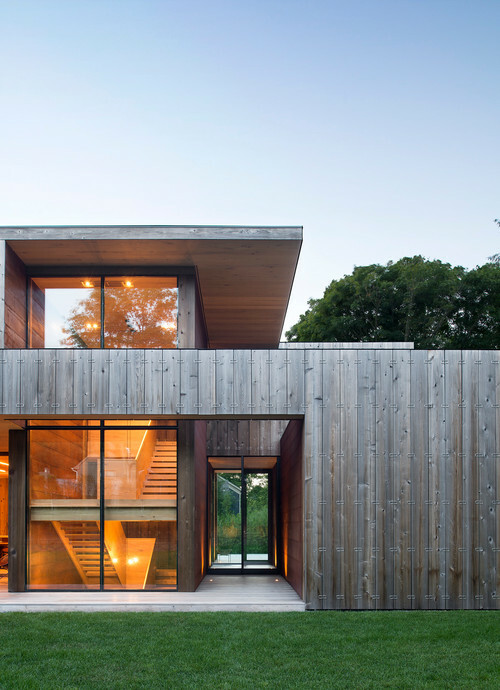 Bates Masi Architects LLC It’s important that the unfinished wood ages evenly. In the same home, the boards are placed vertically, with each board held in place by separate spring clips. The boards are held away from the house, with gaps left between each. This approach is referred to as a “rain screen” and is the optimal way for the board siding to weather evenly on all sides while allowing each board to expand and contract with rain and humidity. Weathering steel: As with wood, once metal has been painted, it needs to be maintained to avoid deterioration and rust. Another approach is to use weathering steel, a special alloy often referred to by its copyrighted name, Cor-Ten steel. This material allows the steel to form an even rust, creating a protective layer on the steel. Eero Saarinen first used the material on a building in 1964 when he designed the headquarters for John Deere. 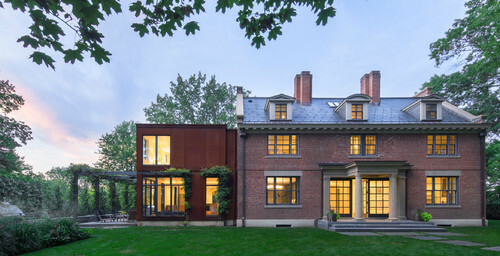 The architecture firm of Stern McCafferty chose weathering steel for the addition to this traditional New England house. 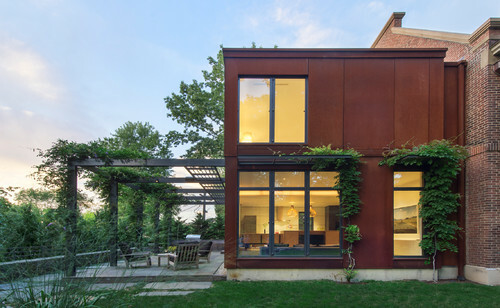 Although the modern cube addition offers a striking contrast to the original house, the warmth of the rusted steel is visually simpatico with the red brick, and both materials age gracefully.